I like to read. I always have. These days I am particularly fond of non-fiction (I never thought that would happen. I still remember how thick the dust settled in the non-fiction section of my high school library). I own a few books now and I’d like to get some more. But I have a conundrum. As I start to collect books I want to organize them in such a way that they bring me the most value over the years to come. Specifically, I want to make sure my books are in the best format possible, so they will remain relevant and useful to me. This is especially important because I’m just starting out my independent life and I’d like to take the time to develop a good system that works for years to come. Unfortunately, the eBook revolution has made this significantly more difficult. Of the formats available today, we have physical books (the 575 year old technology that is still going strong), audio-books (tapes, cds, and mp3s), and eBooks. Of course, eBooks are available in a variety of formats, including .azw (for Kindle), PDF (Adobe’s baby), and at least 25 other digital file formats with several that are only compatible with a handful of devices. Size. You can easily pack thousands of eBooks on to one device. Annotation tools make highlighting, bookmarking, and adding comments a breeze. “Smart” features like video clips and hyperlinks enhance reading (especially for magazines). Free access to a huge library of public domain books. No light source? No problem. They don’t degrade over time (imagine the value of passing your huge library of “good-as-the-day-they-were-purchased” books on to your descendents when you die). It’s the only format guaranteed to last (more on this later). Easy to give, take, share, and borrow. Used books give you all the content for a fraction of the price. Robust. Drop a book from 40 ft, dust it off, be on your way. Drop an eBook reader from 40 ft and it’s all gone. The problem with books (both ebooks and physical books) is that they are a huge investment. If one book costs $25, then receiving 10 books a year for the next 4 years (a realistic estimate) means that you’ve accumulated $1000 of books in a specific format. In the case of physical books, there’s no good way to convert them over to the new format. You just have to buy them again in digital form. Think of all those boxes of vinyl records filling up basements across America and you’ll get the picture. In fact, the music industry is a great example of what is likely to happen. If you invested $5000 in vinyl records, you were out of luck. Suppose you were fortunate enough to buy CD’s instead of records. Lucky you! It was relatively easy to migrate that music over to your computer, burn MP3 CD’s that you could play in your DVD player, and eventually put them on your iPod. But even then, it’s going to cost you $30.00 a year to make them available in iCloud (too bad you didn’t buy them from the iTunes music store). And to be honest, I use Grooveshark so much these days that I’d feel rather miffed about buying the CD’s in the first place. Like vinyl records, eBooks are in the early, clunky, transition phase. There are dozens of file formats, clamoring to be the industry standard. There are a hundred proprietary ways to sync these devices to computers. DRM is a pain. People are juggling their eBook files, managing their collection on multiple devices, trying to back them up in case a fatal drop renders their libraries gone. We’ve got companies that charge a price to convert your files from one format to another, in case your company eliminates its e-reader product line and your files become obsolete. Many of the most popular books aren’t even available as eBooks. Sure, we’ve seen a lot of progress in the last few years. The EPUB format is starting to become universally accepted (though Amazon is still unwilling to board that train). We’ve got half-hearted attempts to build apps that read eBooks, 10 step tutorials on how to do your own eBook conversions, speed typing Indians manually creating eBooks from your paper copies, integration for checking out eBooks like library books, and everybody trying to put eBooks up into the cloud. But whose cloud should we embrace? Google’s? Amazon’s? Should we hold out for an awesome future format that is readable and “playable,” making it an eBook and audiobook in one? 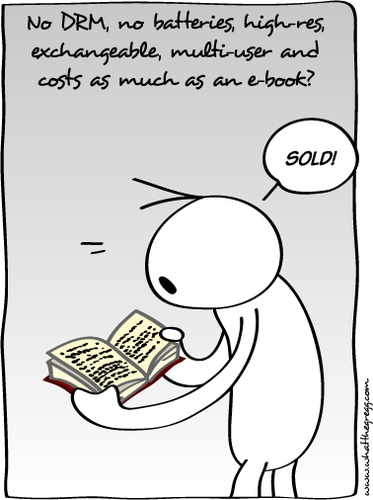 And when is the price for eBooks going to settle down to a more reasonable level (An eBook which costs the publisher $0.00 per copy should not cost the same as a printed book with all of its raw materials and shipping costs)? If it weren’t for this confusion, I’d be ready to stop getting paper books. They’re heavy. They take up space. I don’t tend to re-read books, so why should I have to haul them around for the rest of my life? I don’t want the paper, I want the content… and I only want it once. I believe that all the benefits of paper books will one day be answered by eBook technology. I predict that there will eventually be a secondary market for eBooks. Bugs will be fixed. Battery life will improve. Formats will get sorted out. But I don’t know if I can wait that long.